DUHOK, Iraq- ​It’s been three years since the Islamic State group attacked her village in the district of Sinjar, but Nadine Naif remembers it like it was yesterday. DAHUK, Iraqi Kurdistan — When Nadine refused to marry the 25-year-old Islamic State fighter from Yemen, he took her daughter Ronia instead. Right in front of Nadine’s eyes, he tore the clothes from her daughter’s body. Then he raped the 10-year-old girl. 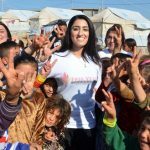 DUHOK– Duizenden Yezidi-vrouwen werden het afgelopen jaar door Islamitische Staat (IS) tot slaaf gemaakt en verkracht. Een deel wist te ontsnappen. Zij keerden terug naar Noord-Irak: ziek, gebroken en ernstig getraumatiseerd. Publication: MO* (also translated in Dutch and French). Over the past year thousands of Jezidi women were made a slave and raped by Islamic State (IS) fighters. Some of them got away. They returned to Northern Iraq: ill, broken and severely traumatised. DAHUK, Iraq — The first man Aniya was forced to marry was an Islamic State militant called Abu Safouan. She was 41 and he was 22, but still he bought her and her 3-year-old daughter at a slave market in Raqqa. After he had raped and abused Aniya for 20 days, he told her he was fed up with her and sold her to a 27-year-old man who called himself Abu Ali Sham.